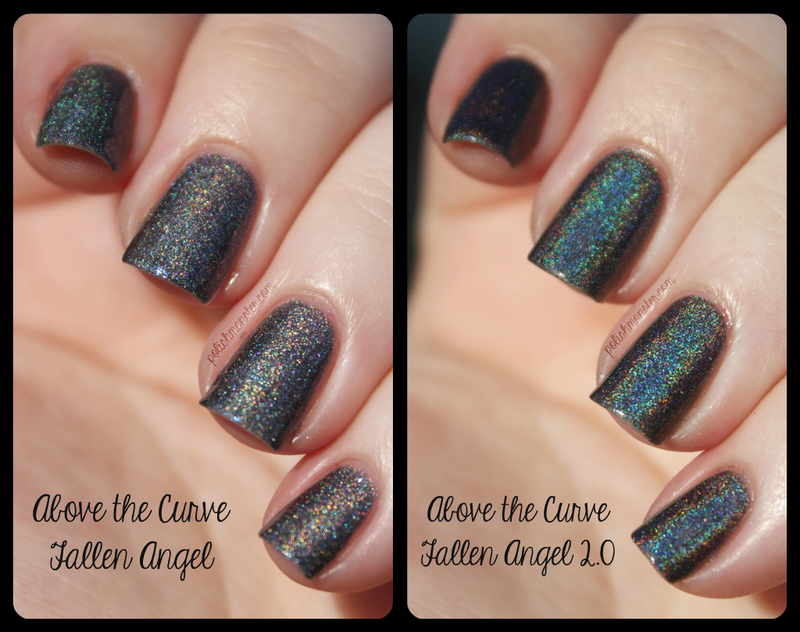 I didn’t quite finish my photos for my next giveaway teaser post, so I thought I would do a quick post comparing Above the Curve’s original Fallen Angel (still available!) and Fallen Angel 2.0 as promised! 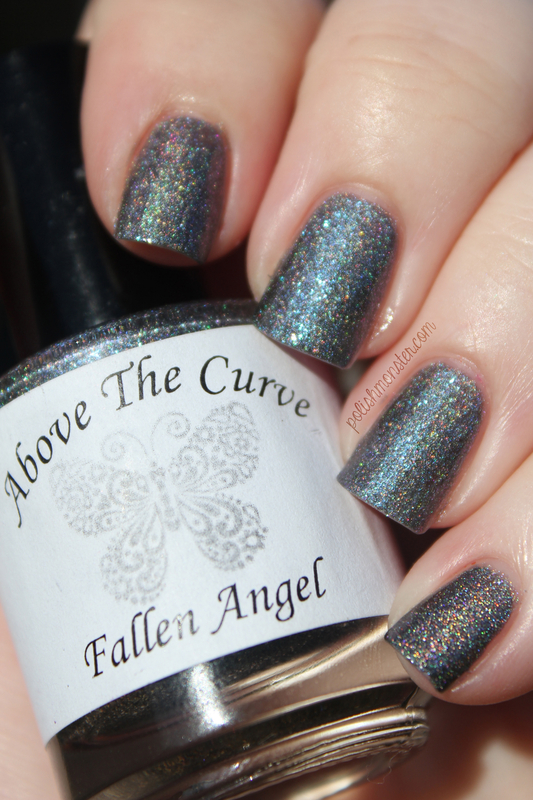 Fallen Angel is a beautiful grey-black holo filled with a blue/purple shimmer. The blue flash is very noticeable- especially in the sunlight. It also helps keep it looking super gorgeous inside, where the holo effect isn’t as obvious. 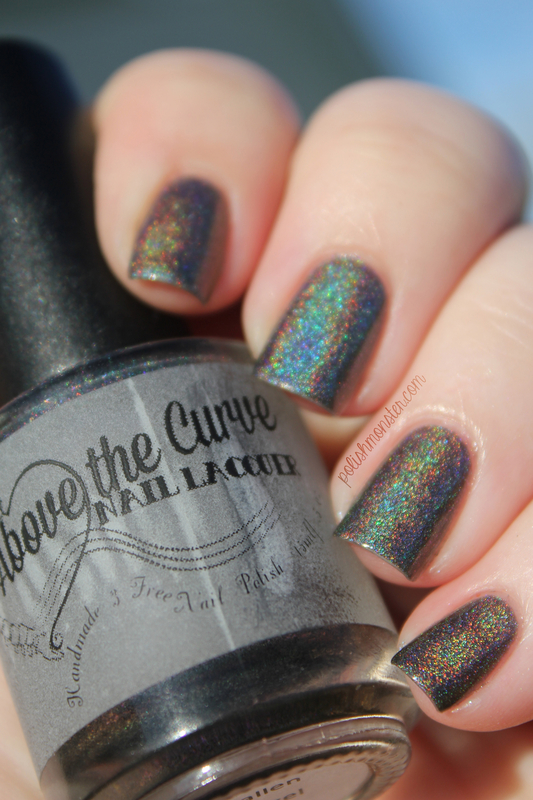 The formula is pretty standard for ATC polishes- which is to say, awesome. I used 2 coats and topcoat for my pictures, but you get pretty decent coverage with 1 coat. A few months ago Shawn and Angel announced 2 new additions to their popular Angel line of polishes- Fallen Angel 2.0 and Risen Angel 2.0! I showed Risen Angel 2.0 a few days ago- much like that one, Fallen Angel 2.0 most noticeable new feature is the very obvious linear holographic effect. Fallen Angel 2.0 is exactly the same as Fallen Angel, but with more ‘oomph’. The holo effect is a lot stronger- I feel like Fallen Angel’s holo is a bit more scattered (though I wouldn’t call it a scattered holo either), and 2.0 is much more linear. The base is still the same color, and there’s still the beautiful blue shimmer. Whenever I wear either of these, I sit at just stare at my nails all day and find excuses to go outside 🙂 Which is saying something because I really don’t like the outdoors- or the heat- or nature. (I like looking at nature- from inside.) 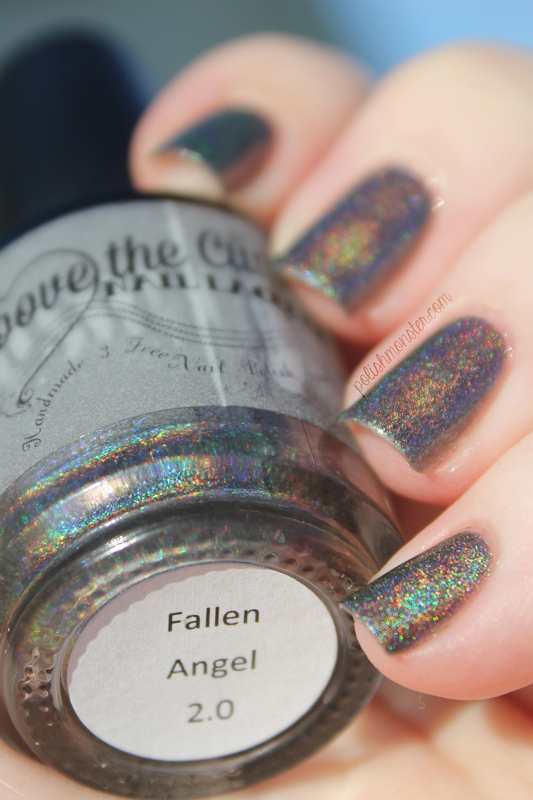 Like Fallen Angel, Fallen Angel 2.0 had great coverage and application. These photos are 2 coats plus topcoat. And here’s a side by side comparison picture! If I’m being 100% honest- I actually prefer the original Fallen Angel. That isn’t to say 2.0 isn’t worth buying (it is! ), but I think the original is just really beautiful. 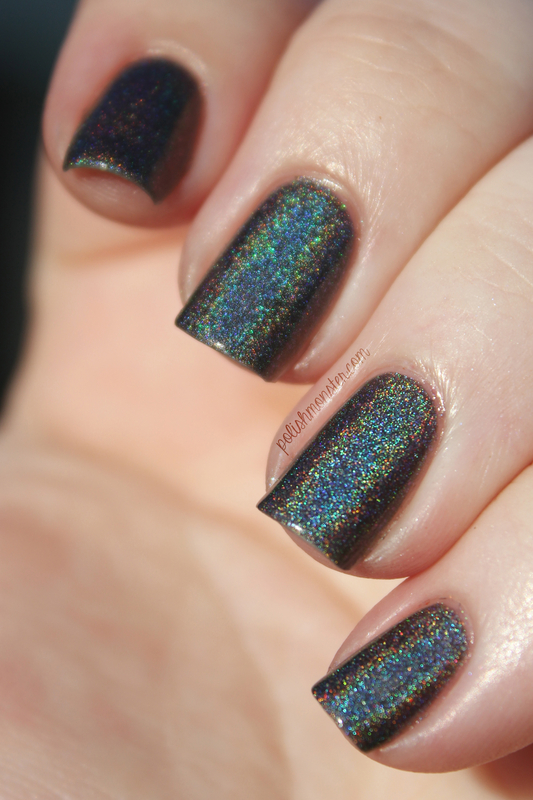 The more scattered holo made the color look a bit more charcoal colored (and I love grey), and the stronger holo of 2.0 hides the gorgeous blue shimmer a bit. 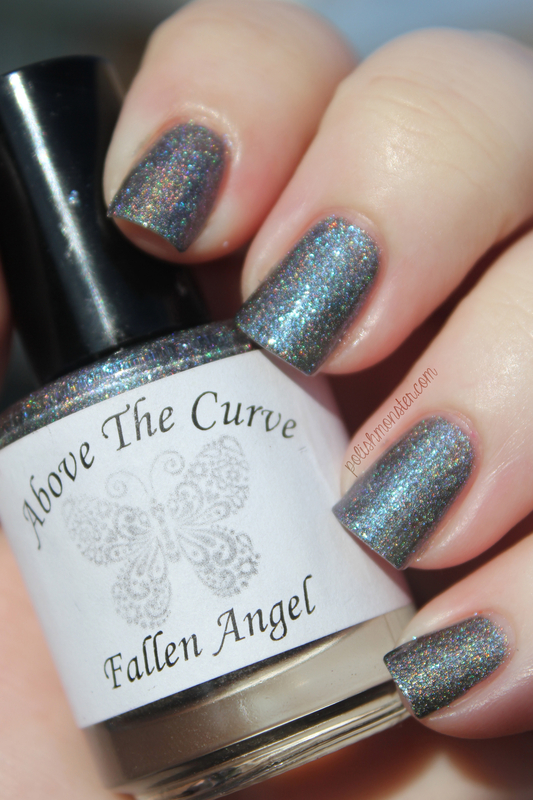 You can find Above the Curve polishes in their Big Cartel store, their Etsy store, and also at Overall Beauty. You can also follow the ATC Facebook page for news and updates. Right now BOTH of these beauties are on sale for only $7 (though 2.0 is sold out at the moment)!!! And as always, $1 from every bottle is donated to Shriner’s Hospitals for Children! This entry was posted on September 4, 2013 by The Polish Monster. It was filed under Uncategorized and was tagged with Above the Curve, ATC, black, grey, holo, indie polish, linear, scattered holo, shimmer.